A new interdisciplinary Initiative for One Health & the Environment at the University of Maine builds on current strengths, and is focused on climate change and emerging issues in animal, plant, and human health. Our natural and managed ecosystems are and will increasingly be subject to regional and global pressures of climate and ecosystem change, which have serious consequences for public and ecosystem health and the health of the animals and plants that our social and economic systems depend on. Climate change already affects all major sectors and constituencies within the state of Maine with resulting economic consequences of animal, plant, and human health issues that are far-reaching in scale and scope. Why “One Health and the Environment”? 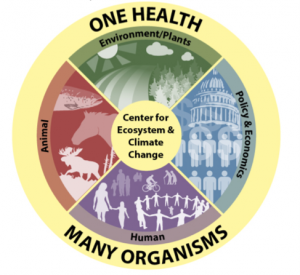 Central to the One Health concept is the understanding that human, animal, plant, and ecosystem health are “inextricably linked”, and addressing the connections between health of all species and the environment is essential for the health of all organisms. At the University of Maine, we are particularly well positioned to contribute to and to be recognized for a One Health & the Environment focus in research and educational programs. We have a depth of expertise in ecological and environmental sciences, and an internationally recognized research institute focusing on climate change (Climate Change Institute), the largest threat of our time to animal, human, and ecosystem health. We have faculty conducting biomedical research with model organisms such as zebrafish, which directly translates and contributes to our understanding of susceptibility and disease development and manifestations across organisms, whether fish, cows, moose, or humans. We have a research and cooperative extension animal diagnostic laboratory (UMAHL) with a focus on health of domestic animals and wildlife and zoonosis (diseases passed between animals and humans), and we have faculty investigating the movement of animal carriers of disease. We have an Aquaculture Research Institute (ARI) investigating a variety of links between temperature warming, coastal pollution, invasive species, and the interactions of these factors on shell- and fin-fish growth, reproduction, and health. We have faculty investigating potential and current water-borne and food-borne pathogens and faculty studying the spread of aquatic and terrestrial invasive species that threaten natural and agricultural systems. In summary, we have many faculty investigating the impacts of climate and other exacerbating environmental stresses (toxicants, invasive insects, pathogens, and parasites) on fish, wildlife, plants, domestic animals, and humans, at the population, organism, cellular, and molecular level. Additionally, we have social scientists who focus their research and teaching on environmental and health economics and policy, measuring the negative economic impacts of a changing health landscape, determining the economic benefits and costs of adopting climate-change adaptation and resilience policies, examining and evaluating alternative financing and risk-management policies, and assisting in developing health communication strategies to help people adjust their behaviors to these emerging health risks. Hence, the phrase One Health, Many Organisms captures the breadth that we bring to the One Health & the Environment concept; we develop and evaluate environmental and health management strategies and policies to solve the myriad of plant, animal, and human health and economic issues that arise as our climate and ecosystems change. Strongly synergize research activities in climate and ecosystem change, infectious diseases, and public health between existing and new faculty, creating a productive, nationally competitive, interdisciplinary team addressing local and global concerns. 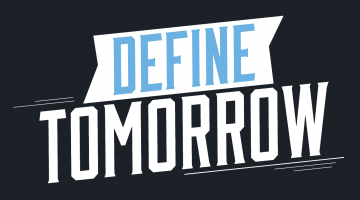 Establish new undergraduate and graduate programs in public health, conservation medicine, and health policy and management allowing the University of Maine to evolve to meet the interests and needs of society and students into the future. Provide students with internships in public policy, infectious disease methods, zoonotic disease investigational methods, control/prevention techniques, etc. Achieve accreditation status for the proposed BSL3 animal/plant diagnostic lab. Expand Maine’s strength in applied research in zoonotic diseases and their public health implications.